Have you recently been experiencing painful sours on the inner surface of your cheek, lips, tongue, mouth or the base of your gum? If yes, chances are that you are suffering from canker sores which are a common form of mouth ulcers. If you are looking for an answer to the question, “How to get rid of canker sores?” then this article will guide you with the best ways to get rid of canker sores. Canker sores are among the most widespread oral problem that are characterized by the presence of white or yellow open lesions with a red inflamed border. Due to the painful inflammation, talking and eating becomes an uncomfortable experience. 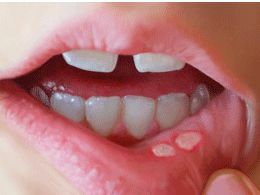 This form of mouth ulcer is usually caused by viral infections and in some cases is also triggered due to a weak immune system. The medical term for canker sore is aphthous ulcer. It is a common mistake to use the terms canker sores and cold sores interchangeably. In reality, they are not the same. Cold sores are fluid-filled blisters commonly known as ‘fever blisters’ that are painful and contagious. Unlike the canker sores that appear on the inside of the mouth, cold sores are usually found on the outside of the mouth. 1. Avoid eating foods that irritate your mouth – This includes citrus fruits such as lime and oranges. You should also avoid eating acidic vegetables and spicy food. 2. Brush your teeth with a soft-bristle brush – Cleaning your teeth roughly causes damage to the inner tissues of your mouth making the region susceptible to infections. 3. Having a balanced diet – A diet rich in vitamin B12, folic acid, zinc and iron will result in an effective metabolism and enhanced tissue formation. The diet should also consist of lysine and arginine for both are essential amino acids. Increasing the intake of the amino acid, lysine, for canker sore comes under the list of effective canker sore cures. 4. Avoid using toothpastes and mouthwash containing sodium lauryl sulfate – Studies show that sodium lauryl sulfate causes irritation in the mouth leading towards canker sores. So the next time you find yourself wondering, “How to get rid of a canker sore?”, make sure to check the ingredients of your toothpaste and mouthwash. How to get rid of a canker sore? a. Diphenhydramine suspension – This has anesthetic impact on the soft mouth tissues and provides instant relief for canker sores. Use it for 30 seconds to one minute and then spit it out. b. Anti-inflammatory steroid mouth rinses – This is an effective canker sore pain relief and helps to minimize the inflammation. c. Tetracycline antibiotics rinses – This aids in the healing process of canker sores but its usage is strictly prohibited by pregnant women and children under 16 years. 4. Use of canker-rid – There are various brands of canker-rid available on Amazon.com that serve as an effective remedy for immediate relief of sore pain. 5. Use of canker covers – These covers are like patches that isolate the canker sores from direct contact with the tongue, teeth and food. This aids the healing process of canker sores. In severe cases your doctor may prescribe oral steroids, such as corticosteroids, as a last resort for treating canker sores. What are the home remedies for canker sore? 1. Milk of Magnesia – Apply a small quantity of milk of magnesia on your painful sore three to four times a day. 2. Half water, half hydrogen peroxide mixture – This is one of the easiest home remedy for getting rid of a canker sore. Use a cotton bud to apply the mixture to the sore and see the wonders of natural canker sore remedy. 3. Salt gargles – If are wondering how do get rid of canker sores in your mouth then this the best way to treat them. Add one table spoon of salt in a glass warm water and use it to rinse your mouth. After rinsing, apply salt directly to the canker sore. The latter may be a painful process but it has is an effective canker sore cure. 4. Aloe vera – Many people are wondering as to how to get rid of canker sores on tongue. Aloe Vera has anti-inflammatory properties that help to minimize the uncomfortable symptoms of canker sores. Using aloe vera for rinsing mouth is another cure for canker sores with nil side effects. Add one to two tablespoon of aloe vera in water and rinse your mouth with it. 5. Baking Powder – Add a few drops of water to baking soda giving it the consistency of a paste. Apply it to the affected area and after persistent usage for a week you will see positive results. This is a commonly used home remedy for canker sore. 6. Ice – To alleviate yourself from the discomfort of burning sensation apply a small-sized ice cube over the canker sore until it dissolves. This acts as a temporary pain reliever for canker sores. 7. Tea bags – Tea contains tannic acid which neutralizes the pain along with speeding up the healing process. Take a used green or black tea bag and put it in the freezer. Place the cool tea bag over the canker sour for fifteen to twenty minutes. 8. Organic onions – Press raw organic onion against the canker sore to allow the juice to seep in. The medicinal properties of organic onion will help to ease the pain and discomfort caused by the canker sores. This procedure should be repeated three to four times a day. 9. Tea Tree Oil – This oil is popular for its antiseptic and anti-inflammatory properties. Depending on the severity of your condition, put three to four drops of tea tree oil in a glass of water and use it to rinse your mouth for a minute. Tea tree oil acts as a natural skin disinfectant which helps to reduce inflammation. Tea tree oil is actually not for oral consumption because it can be toxic. Use sparingly and never swallow. After taking the necessary measures, if you still find yourself asking the question as to how to get rid of a canker sore then you need to consult a doctor immediately. Abnormally large and painful canker sores. Recurrent sores lasting for more than three weeks . Canker sores are accompanied by a high fever. Diarrhea or skin rash along with canker sores. Roof Of Mouth Hurts – Pain, Sore and Swollen Palate?